Intro class open to all beginners. Learn how to hand knit these fun and cozy blankets! You will love the soft cozy merino wool blankets! This class takes places in MAMMOTH at the beautiful WESTIN MONACHE RESORT. Please call us with questions as this is an offsite event! We look forward to crafting with you in the mountains! Dr. Gordon is a naturopathic and functional medicine doctor and founder of Tribe Medicine--an integrative and holistically-minded medical practice partnering with two locations in San Diego: Trilogy Sanctuary in La Jolla and Indigo Dragon Center in Encinitas, CA. She offers a unique and personalized approach to her client’s health, utilizing in-depth specialized medical testing and comprehensive intakes to uncover the root causes of suffering. Her own healing journey, paired with her rigorous medical training, has made her an expert in understanding the obstacles to healing in the areas of hormone balance, thyroid and adrenal conditions, gut health, anxiety and depression, and preconception and fertility care. Dr. Gordon is especially passionate about teaching and empowering our TRIBE of women to live healthier lives for the health of themselves, their children and future children, their communities, and our planet. Love monstera leaves? Need a little bird of paradise in your life? Join us at Mint Studio! Don't worry, this workshop is designed for beginners. You don't need to have an artistic bone in your body to make some gorgeous watercolor paintings. I will review the basics of color theory, mixing, and how to use watercolors effectively in your composition. Each attendee will take home a palette filled with my favorite tropical color paints, two brushes, a pencil, an eraser, a pad of watercolor paper, and an instructional booklet. YES, you get to keep everything! Join us for this trendy grazing board design class. Choose your style wood and stain. We will do an abbreviated hand lettering class and will wood burn your favorite quote or phrase. Enjoy this for years to come! 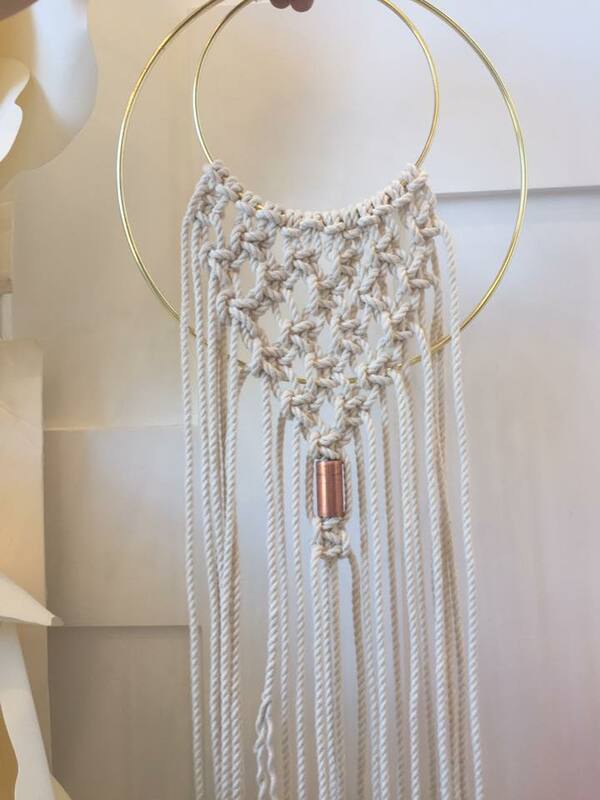 Join us for a fun morning of mimosas and macrame! You can also custom order and piece you would like made. Call or stop by the studio for more details. Follow the story on instagram @mintstudiosd. Learn the art of Punch Needle, even if you've never embroidered before. Think latch hook meets embroidery sewing. It's a fun, easy craft that you will find relaxing and creative. Each project is double-sided. You can use the side that embroiders smooth stitches or the opposite side that leaves lovely, tightly woven loop, like a rug. We will use Monk cloth, pre-stretched in a wood embroidery hoop, an Amy Oxford punch needle that is yours to keep, and Quince wool yarn for our project. 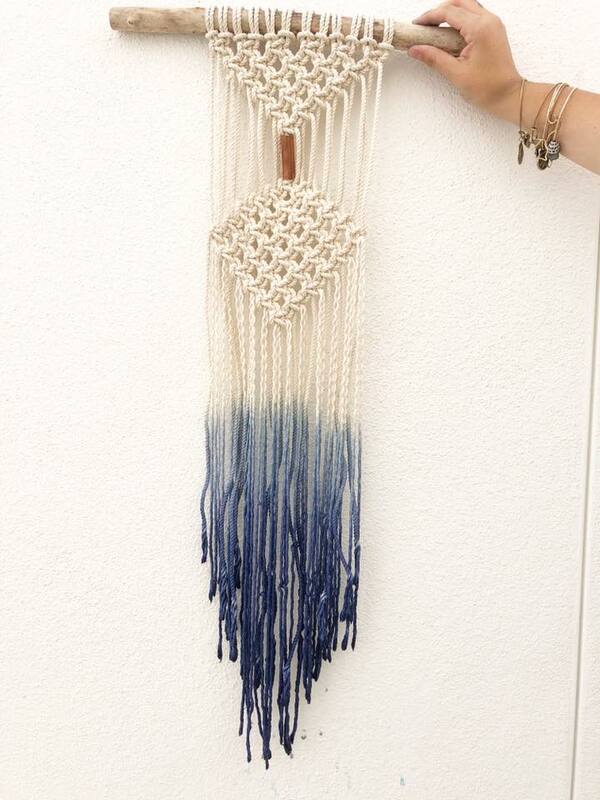 Join for an intro to macrame class to create a wall hanging! When we clean with conventional products found in stores we might be getting rid of dirt & germs, but we are filling our homes with toxic and dangerous chemicals that can have serious consequences on our health. Join us for a fun and educational workshop where we will teach you all about how to detoxify your home of chemical cleaners and ditch-and-switch your products to live a purer, more natural lifestyle. It’s so simple and you can do it without breaking the bank! Blaine Tiongson, a native San Diegan, mom of two and the creative owner of Momma Pots, is transforming how we look at design. This class will allow you to create your very own pots. Each person will be able to make a marble pot and see how the process is done as well as create a concrete pot using tips from Blaine on how to make geometric designs. Lastly, you’ll have the opportunity to make a Concrete Small Pot or Shooter, which are great gifts or a perfect addition to your home or workspace. (1) Large Concrete Bowl-4"x 6" D: 3"
(1) Concrete Small Pot-1.75"x 3" D: 1" or Concrete Shooter-2.25"x1.75" D:1.75"
We are excited to welcome stylist Michael Burton and Kai to host a night set aside only for young gentleman. Michael Burton stylist and owner behind MB Styles provides image consulting to professionals within the financial, real estate and entertainment industries. Kai has over 15 years of experience in leadership development and specializes in tean building, millennial management and organizational culture. The Young Gentleman’s Playbook was created to brand young leaders. We teach leadership through creative workshops that promote team-work, outside the box solutions and most importantly how to be socially aware and carry oneself in the most professional and natural manner. Special Guest: 1202 Supply Company | Handcrafted leather Good by local maker Robert Putaro. In this workshop, you’ll discover areas in your life you may have never realized negatively affected your health. You will learn how to recognize these areas and begin to shift or replace them to support your mind, body and spirit in health and happiness. Dr. Gordon will share highlights from her comprehensive Cleanse Your S*P*A*C*E program, bringing light to the main pillars of your SPACE: Sanctuary, Products, Air, Chemicals, and Energy. Participants will also receive her guidebook with practical tools, favorite products, and lifestyle recommendations to create the healthiest environment you can for you and your family. This workshop is for women who want to learn how to have homes and lifestyles that are truly a sanctuary for their families, fostering health rather than imbalance and disease. There is so much creativity in today's wedding and design world and getting your styled photo shoot publised is a key marketing tool to getting noticed by potential clients and creative partners. Learn the inside secrets to get your styled shoot published because it's not always about the color me you choose. Join Suher Haidar, Senior SoCal Planner for Francine Ribeau Events and Mentor of Refined by Suher, to discuss the latest wedding design trends and her step-by-step process in creating a successful photoshoot worth publishing. Celebrate Cindo de Mayo and join us for a fun afternoon of crafting! Learn to make your own pinata! Choose from a cactus, Frida or Llama design. This event is open to all ages! We will also be having a "Pajamas and Pinatas" donation drive for children for abandoned, orphaned and vulnerable children in Tijuana. Donation boxes will be placed around Flower Hill Promenade or bring your new pajama donation to the event. All sizes needed. Angels 2 Angels is a mission-centric 501(c)3 charitable organization dedicated to bringing consistent sustainable change to orphanages, so that they can provide the highest standards of quality care to children. Their vision is to a world where every orphaned, abandoned and neglected child has access to protective and nurturing care, safe shelter, nutritious food, clean water, education, and healthcare. Likewise, that all orphanages and children’s centers are sustainable and offer long-term impact to break the cycle of poverty. Join us for taco truck and fun festive Cinco de Mayo festivities! 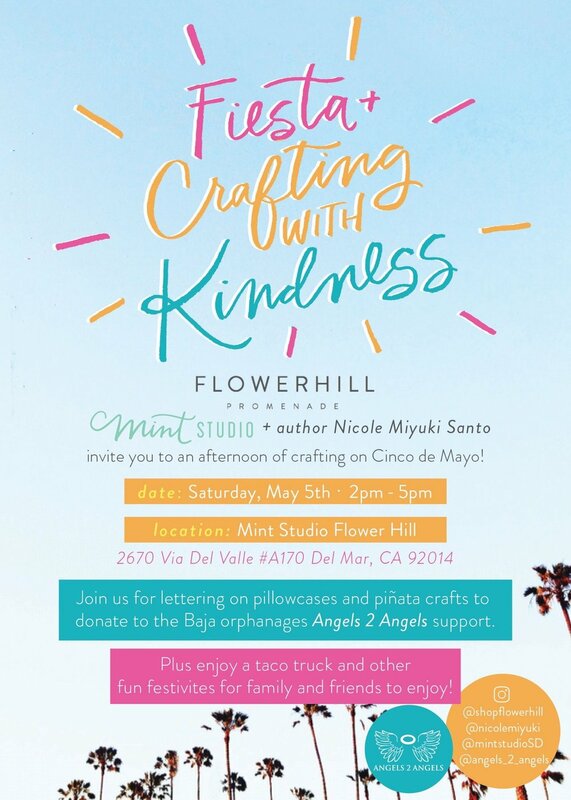 WHY: Join us as we celebrate Nicole Miyuki and the non-profit Angels 2 Angels for an afternoon of crafting and a fiesta! We'll be lettering on pillowcases (from project 29 of By Hand) with all crafts going to orphanages Angels 2 Angels support. In true fiesta from, there will be a taco truck and fun festivities for everyone to enjoy! This is one you won't want to miss. WORKSHOP: Looking for some hands on in-person lettering instruction? Nicole will be at the Mint Studio Carmel Valley Location teaching my Watercolor Brush Lettering workshop Saturday, May 5th from 10am-1pm. Have you been itching to learn something new? Been seeing all of these lettering posts on instagram and thought - "hey I want to do that too!" Well you definitely can and this class might be the perfect jump start for you. In this 3-hour class, you will learn how to gain confidence with the brush, how to create a brush-lettering style and the steps to take a piece from concept to finalized piece. Nicole demonstrates how to transition to combining the letters into words, how to create/define your own style and how to blend colors to create an ombre look. With the small class environment and Nicole's teaching style, each student will receive one-on-one attention and individual help. 36 color watercolor palette, pad of paper that Nicole has found is best for scanning/creating work, 2 brushes, jar of white and gold ink an a complete booklet of information with Nicole's lettering style and lesson plan. WOOD BOX: If you would like to purchase a custom wood box to keep all of your supplies, purchase here. 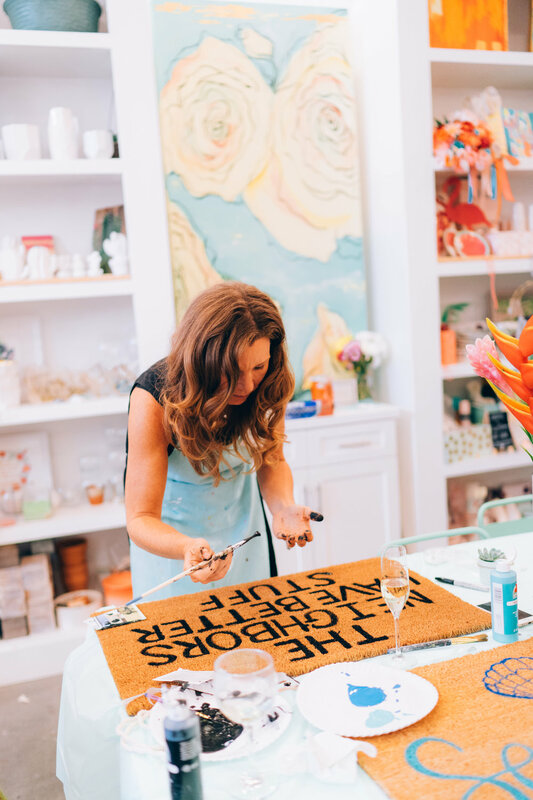 "I had zero background in calligraphy/art/design before taking Nicole's workshop. But thanks to Nicole's patient and encouraging style, small class size (I appreciated the extra help!) and starter supply kit to take home, I found myself continuing to letter at home. It began as an escape for myself as a new mom. Soon enough - six months after taking Nicole's workshop - I opened up my own shop on Etsy selling Hawaiian-inspired hand lettered designs." 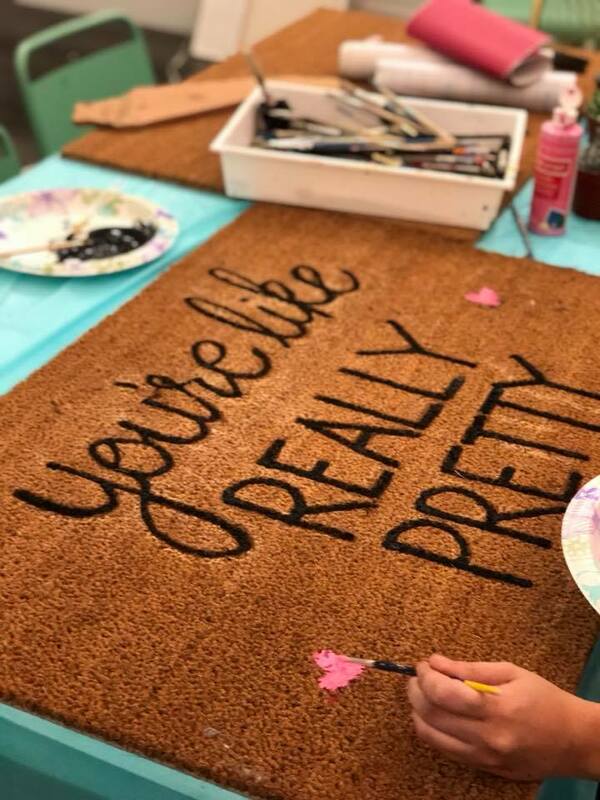 Join us for bubbly and some really fun custom door mats! Join us at Mammoth Yoga Festival! Create Outdoors! Learn the basics of creating your own notebooks from scratch and take home a one-of-a-kind journal of your own! Each journal has 96 pages and is made from salvaged leather. We'll bind the sides of the journal, add a tie (and a button if you'd like) and decorate the front with fabric, leather, and paint. Look forward to seeing you there! Join us after your 8am BOGA Yoga Paddleboard specifically designed for yoga. For more information on yoga schedule, go to www.mammothyogafestival.com. Stay up to date and tag us in your experience! As seen on Hostess with the Mostess, Casa Artelexia, Project Nursery, Catch my party, Pretty my party, Speaker at BASH conference, The Modern Mom, Refinery 29 and Urban Style Weddings blog, 1 of the 10 top DIY paper flowers on pinterest and Martha Stewart american made nominee. DIY class we will make giant paper flowers with of our pre-cut kits 28” wide! You will learn how to make our paper flowers, how to curl your petals, and make our famous centers! Kits and curling tools are included in your fee. Tania Fischer is an Mexican-American artist based out of San Diego. Tania has a degree in Graphic Design and she has been a packaging and product designer for the last 15 years giving her the knowledge of different materials to work with. For the past 4 years she has been developing different giant paper flower techniques. She's been featured on Hostess with the Mostest, Catch my Party, Ceremony magazine, Parents magazine and many more, Speaker at BASH Conference and Martha Stewart American Made Nominee (2016). Also worked with companies like Macy's and Honest company. She is excited to teach workshops, share her techniques and tips. Loves teaching and has been around the US with this paper flower class. Join us while we dive into watercolor and gouache to create a pretty, motivational piece of art! All ages 10 years and up welcome. Great for sharing with family or friends! -In this class you will receive instruction on basic watercolor technique and how to use gouache paint to make it BRIGHT and BOLD! We will invite the use of mixed media to accent your piece in your own unique way. -You will have access to a watercolor artist set and brushes during class. You will also receive three samples of gouache to use during class and take home. Mollie Garre is local artist, mother of 3 and Clinical Social Worker by trade. She learned early in her practice the role art can play in healing and allowing a person to speak. At the moment she is primarily focused on raising three young children, but the fire to advocate, celebrate, and speak up for others is wildly alive. Surrounding her children with art that spoke to their hearts and imagination is important to Mollie. She covered their rooms with pieces that celebrated diversity, were motivational, and promoted their self esteem. Mollie Garre currently resides in San Diego but was born and raised outside of Portland, OR. She went to the University of Washington, Seattle for both my bachelor’s degrees (in Political Science and Spanish), and my Master of Social Work degree. This workshop will teach you a simple embroidery stitch and the art of creating felt flowers, taught by Mint Studio's own @shawnaparksphoto. Make this cute home decor with your name or your family's name. Join us for a fun morning of macrame and succulents. Beginners welcome to this class! Make a fun shelf or plant hanger for your succulents! Join us for a fun workshop while we host one of San Diego's favorite local candle makers! You will learn how to pour your own candle and take home 3 different scents that you choose and make. Enjoy craft beer from local brewery, Stumblefoot and wine. In the spring of 2015, wife, mother of four, military veteran and maker, Melissa Burgess, received her first DYI candle kit. Melissa quickly fell in love with the candle making process and began pouring them for her home, friends, and family. After signing up for a handful of local maker's markets, Melissa's unique blends, strong fragrant throws, and muted packaging, quickly gained the attention of San Diego consumers and retailers alike. Now what was once a part-time hobby has become a full-time family business with a retail/pour studio in Oceanside, CA and over 150 retailers across the country! People often ask where the name Craft + Foster originated. It’s pretty simple! The word “craft” refers to the artisan craft of candle making, while “foster” speaks to Melissa and Chad's desire to create products that subtly enhance life’s everyday moments, by fostering warmth and light to any space and occasion. Want to try Punch Needle? Now's your chance make a Punch Needle project at Queen Bee Market! Punch Needle is a fun, relaxing needle art. Think of a cross between latch hook and embroidery. Each project is double sided. One side has a beautiful smooth look. The opposite side has tightly woven loops that look almost rug-like. We will be learning with Amy Oxford punch needles and Quince wool yarns on Monk cloth, stretched over wood embroidery hoops. Your admission to Queen Bee Market is included with your ticket! Come check out all of their awesome vendors with local makers and artists! Registration in advance is required. See you there! Design your own jean jacket with beautiful embroidery. Beginners welcome, jacket and all other materials supplied. Space is limited, please select jacket size at registration.